Ascension is an exploration of consciousness and transcendence through abstracted landscape painting and the poetic narrative of found objects. The code or cipher of this work is captured and explained through the mediums as a vehicle of the message: the transportation of the soul is found in everyday things. Philip J Grant was born in 1963 in Glasgow, Scotland, and attended Fanshawe College in London, Ontario and the University of Windsor. He opened several studios in Toronto and exhibited at Olga Korper, The Rhino,the Rivoli and Round Up 88. 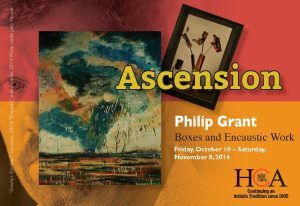 After returning to Hamilton in 1991, Philip concentrated on exhibiting at the Art Gallery of Hamilton, Grimsby Public Art Gallery, London Regional Art Gallery, Hamilton Artists Inc, Art Now Fair NYC, 2008, the Burlington Art Centre and Transit Gallery. He presently lives and works in Hamilton’s east end.